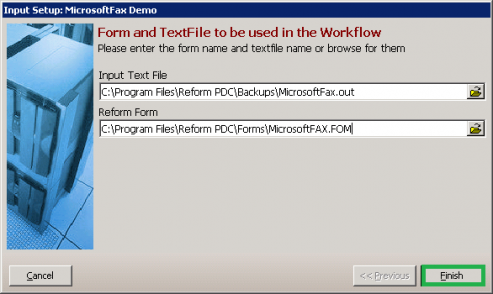 The Microsoft Fax plug-in will integrate with the Reform application in order to send faxes to any fax machine. Microsoft Fax is a fax component built into Windows operating systems that provides the user with the ability to send and receive faxes. The Microsoft Fax Plug-in integrates seamlessly to the Fax component. 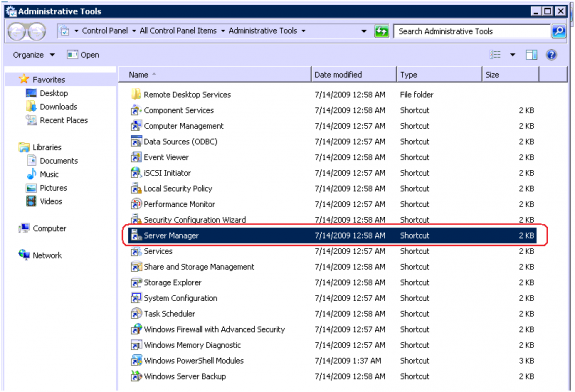 Evaluation and Demonstration: Windows 7, 8, 10 or Windows Server 2008, 2012, 2016. 64bit only. Recommended for Production Systems: Windows Server 2008, 2012, 2016, 64bit only. Note: Reform v15 server software is designed only for 64 bit systems. FabSoft client technologies, such as print drivers and workstation applications, support both 32 and 64 bit computers. For Reform installations on 32 bit servers, use v14. 4. Dedicated server, no other software products except for virus and security programs. Both VM Ware and Hyper-V are tested and supported. Document throughput may be affected due to the nature of virtual machines. VM will distribute and divide the Network card, Hard Drive and Processor among the other VMs being supported by the physical server. Dual processors on make a notable difference for high volume solutions. Hardware specifications depend greatly on the workload and throughput that is required. Higher end processors and greater amounts of memory will increase the amount of information and data that Reform can process thus improving overall system throughput. For load balancing or failover, multiple servers can also be used. (Note: A license for Reform and each Plug-in is required for each server running the software.) Before obtaining the server that you plan on utilizing for Reform, please check the Plug-ins’ user manuals for System Requirements as well as the Hardware Requirements. For production systems, we also recommend battery backups are also suggested to maintain system uptime and reliability in case of power failures. Fax Modem: FabSoft has tested using a US Robotics USB Dial-Up Softmodem (USR5639) cost $20.81 with a Windows 2012 R2 server. For example, excluding the Windows 2012 operating system and computer this fax solution cost $20.81 and can deliver up to 3,000 faxes a day. All of the fax software comes included with the Windows operating system. 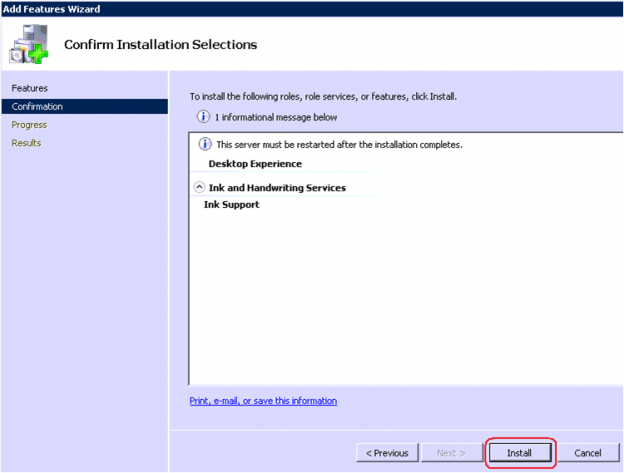 To install the Microsoft Fax plug-in to your existing Reform Enterprise installation, download and run the Microsoft Fax installation executable. Step through the prompts until the setup begins. 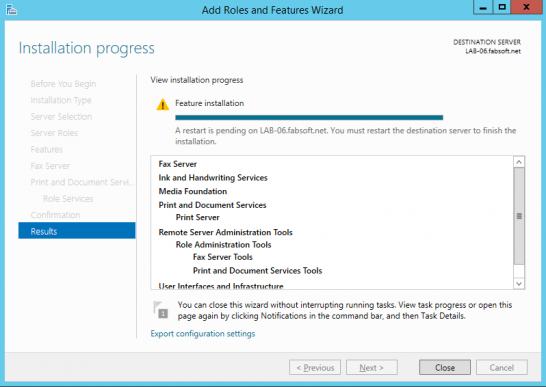 Allow the MS Fax installation to complete. 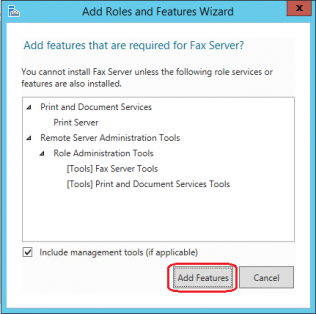 Before you can use Microsoft Fax, you must have the Fax Server role and Desktop Experience feature enabled via the Server Manager. 1) Click on Administrative Tools as shown below. 3) To enable the Fax Role, click on Roles and proceed to add a new role. 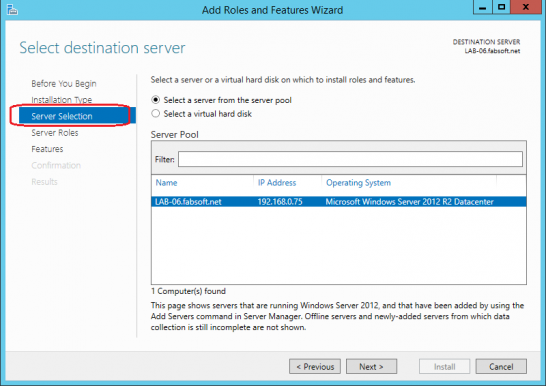 4) Click Server Selection and select the local server from the server pool in the list. Click Next to continue. 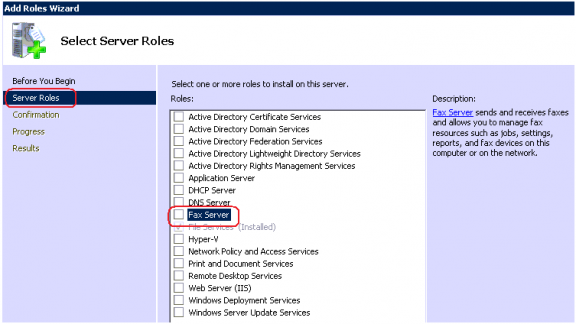 5) Select Fax Server from the Roles list. 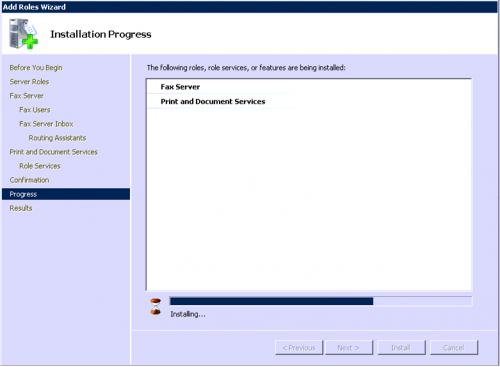 6) If Print Services or required Administration Tools are not installed, you will be prompted to install them as well. This is a dependency needed for Microsoft Fax to work. Click Add Features. Then, click Next. 7) From the Features list, expand User Interfaces and Infrastructure. Then select Desktop Experience. The Desktop Experience is required for sending documents through the Microsoft Fax device. 8) If the feature requirements for Desktop Experience are not already installed, you will be prompted to add them as well. Select Add Features. Then, click Next. 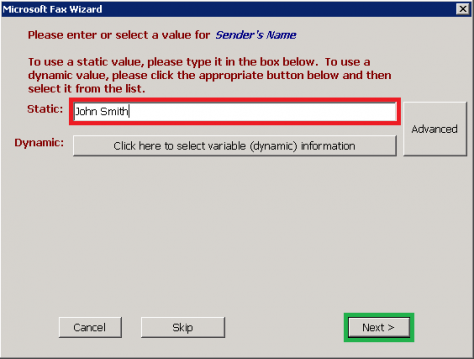 8) At the Fax Server section of the wizard, click Next. 8) At the Print and Document Services section of the wizard, click Next. 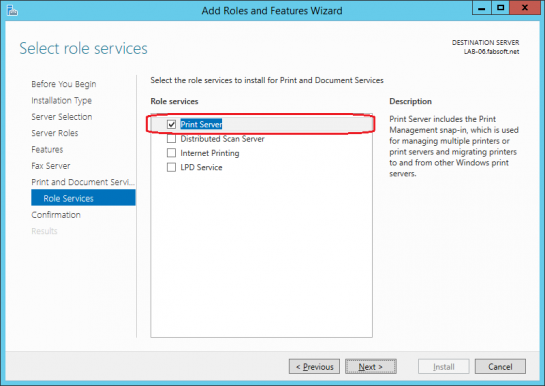 8) At the Role Services section of the wizard, check that the Print Server option is selected and click Next. 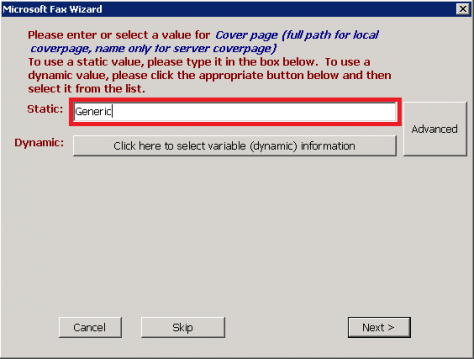 8) At the Confirmation section of the wizard, click Install to begin installing the selected roles and features. 8) Review the Results section of the wizard. 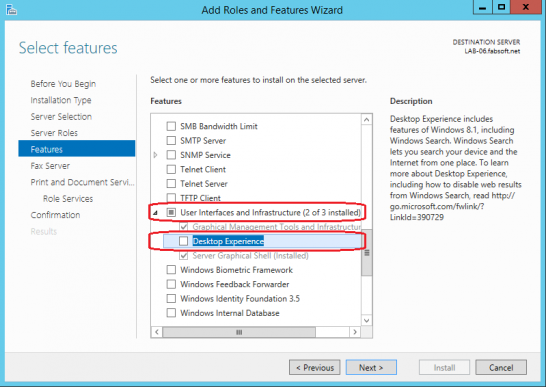 Click Install to begin installing the selected roles and features. 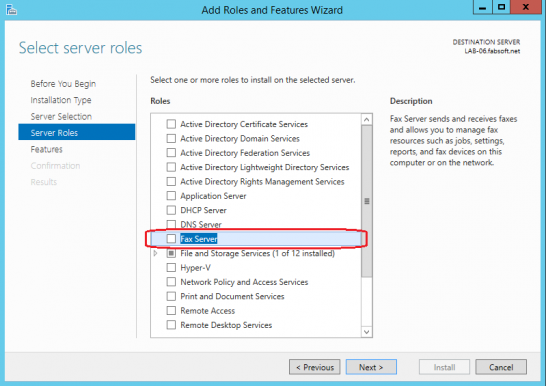 9) Restart the computer to complete the Microsoft Fax roles and features installation. 10) A new item will appear in your printers and faxes list named Fax. 11) Double-click the Fax icon to open the Fax and Scan Console and begin the configuration. 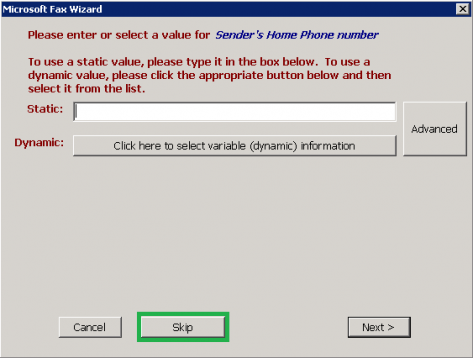 12) Step through the wizard and allow Windows to automatically find your modem hardware. The drivers you will need to install for the modem are dependent on the brand of modem you have, so select the appropriate drivers and finish the wizard. 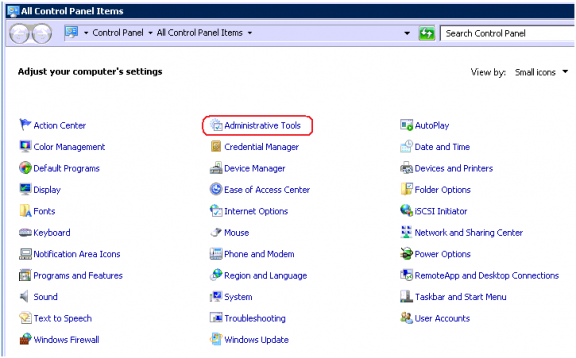 13) Additional Fax Server settings can be configured from the Fax Service Manager found at Control Panel > Administrative Tools > Fax Service Manager. The Fax Service Manager can configure the devices, accounts, routing, cover pages, and rules. Note: Right clicking on the Fax (Local) entry on the left pane and choosing Properties allows for advanced settings to be modified. 14) You are now ready to setup your Microsoft Fax enabled form. To install the Microsoft Fax component on Windows 2008, The Fax Server role and Desktop Experience feature are both required. Since the location of these required installations are in different locations, the instructions are separated to explain them individually. Both of the following sections are required for Microsoft Fax to function properly. 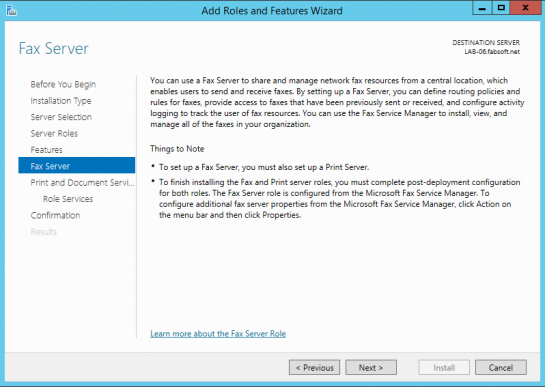 Before you can use Microsoft Fax, you must have the fax services role enabled via the Server Manager panel. 15) Click on Administrative Tools as shown below. 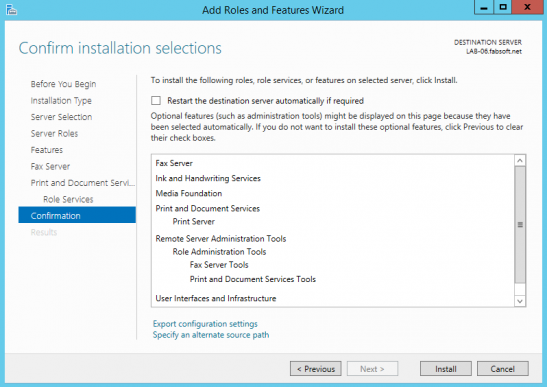 17) To enable the Fax Role, click on Roles and proceed to add a new role. 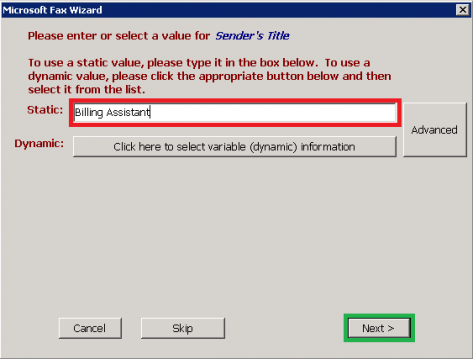 18) Click Server Roles and select Fax Server in the List to display the Add Roles Wizard. 19) If Print Services are not installed, you will be prompted to install Print Services too. This is a dependency needed for Microsoft Fax to work. After adding the required role, proceed and click Next. Click Next again to skip the Introduction Window. 20) Selecting the Fax Users or Groups. 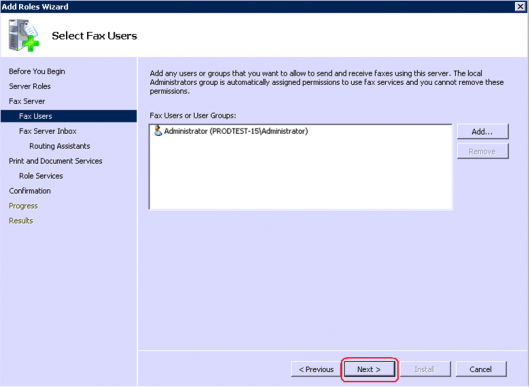 The Local Administrators group is automatically assigned permissions to use fax services. This can be restricted by the administrator to allow only specific users or groups to use Fax Services on this server. Click Next. 23) Click on Administrative Tools as shown below. 26) Select Desktop Experience from the list of features. 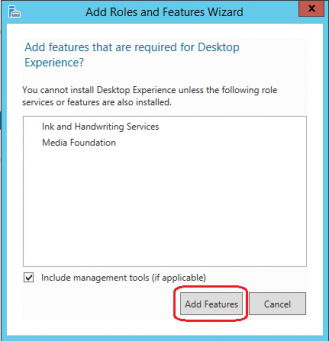 27) If prompted to install required features for Desktop Experience, click Add Required Features. Click Next until you reach the Confirm Installation window. 28) Click Install to Install Desktop Experience. 29) Now that the Desktop Experience has been installed you will be asked to restart the server. 30) Click Yes to restart the server and complete the Desktop Experience Installation process. 31) A new item will appear in your printers and faxes list named Fax. 32) Double-click the Fax icon to open the Fax and Scan Console and begin the configuration. 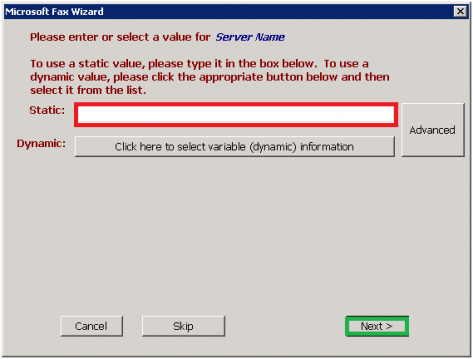 33) Step through the wizard and allow Windows to automatically find your modem hardware. The drivers you will need to install for the modem are dependent on the brand of modem you have, so select the appropriate drivers and finish the wizard. 34) Additional Fax Server settings can be configured from the Fax Service Manager found at Control Panel > Administrative Tools > Fax Service Manager. The Fax Service Manager can configure the devices, accounts, routing, cover pages, and rules. Note: Right clicking on the Fax (Local) entry on the left pane and choosing Properties allows for advanced settings to be modified. 35) You are now ready to setup your Microsoft Fax enabled form. After you install the Microsoft Fax Drivers, you need to add a fax printer that the Microsoft Fax plug-in can communicate with. 2) A new item will appear in your printers and faxes list named Fax. 3) Double-click the Fax icon to open the Fax Console and begin the configuration. 4) Step through the wizard and allow Windows to automatically find your modem hardware. The drivers you will need to install for the modem are dependent on the brand of modem you have, so select the appropriate drivers and finish the wizard. 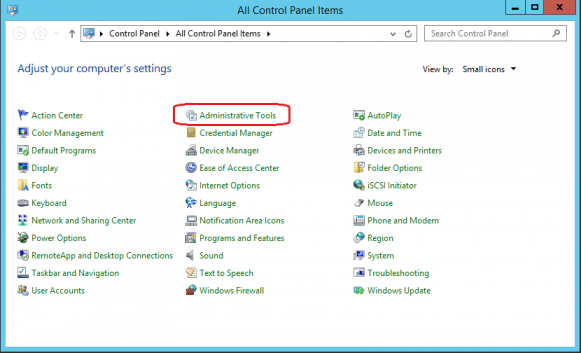 5) Additional Fax Server settings can be configured from the Fax Service Manager found at Control Panel > Administrative Tools > Server Management. The Server Management interface can control the Fax Service as well as other server properties. Using the Fax (Local) section in the left pane allows you to configure the devices, accounts, routing, cover pages, and rules. Note: Right clicking on the Fax (Local) entry on the left pane and choosing Properties allows for advanced settings to be modified. 6) Leave the Fax Console Window open so you can use it to view sent faxes. If the fax modem you are trying to configure is on the same server used by Reform then the following steps may be skipped. Otherwise, for the Microsoft Plug-in to function properly, you must connect to the fax printer on the server. Below is a demonstration on how to do this. 1. Before connecting to the fax server’s fax printer, the service account for the Reform Microsoft Fax plug-in must be configured. 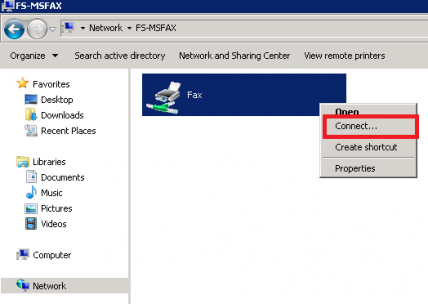 Since shared printers are only available to the user that connected to them, the Reform Microsoft Fax plug-in cannot run as Local System or Network Service when using an external Fax Server. 2. IMPORTANT: The RM_MicrosoftFax Service must have local administrative privileges in order to function correctly. 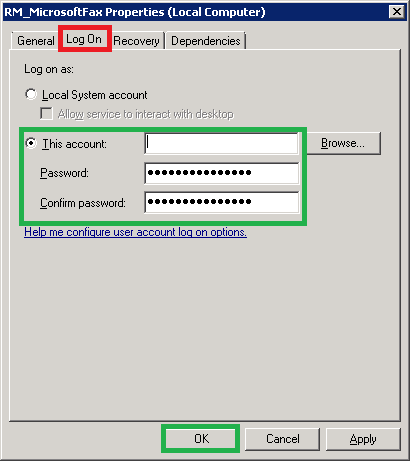 To change the service logon account, go to Start > Programs > Control Panel > Administrative Tools > Services. 3. 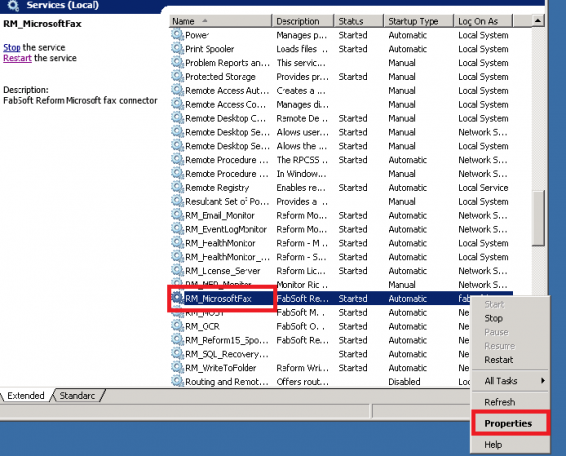 Right click on RM_MicrosoftFax and select Properties. 4. Navigate to the Log On tab. Select the "This account" option. You can manually enter the account credentials or use the Browse… button to search for one. Once you have entered the correct credentials, click OK to save your changes. 5. If the service is already running, it will need to be restarted by stopping and starting the service. If the service is not started, start the service. 6. Now that the service account is set, you will need to log into the server using the service account. Note: This is a required step. 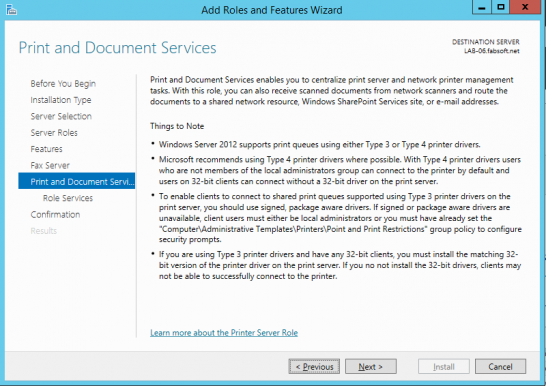 You must be logged into the server as the specified service account before connecting to the shared printer on the fax server using the steps below. 7. Once you are logged into the server as the service account specified for the RM_MicrosoftFax service, click Start and type your fax server name IP address beginning with "\\"in the box. For example: ## Error converting ##: [\\FaxServerName \\FaxServerName] or ## Error converting ##: [\\192.168.0.50 \\192.168.0.50] . Press enter to navigate to the specified server and view the shared printers/folders. 8. 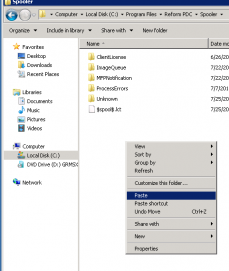 The shared folders and printers of the specified server should be displayed. Right Click on the fax printer and click Connect on the popup menu. This will connect the Reform Server to your fax printer on the Fax Server. 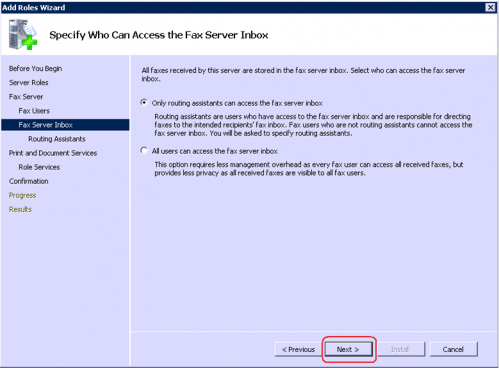 This tutorial will walk you through the steps of setting up a form to send a fax using Microsoft Fax. Before attempting to continue with the Microsoft Fax Form configuration, it is recommended that a test fax be sent directly through the Microsoft Fax interface/printer to ensure correct fax communication. First, the VDP Designer must be started. To open it, go to Start > Programs > Reform… > Variable_Data_Printing > VDP Designer. 1) For the example, we will be creating a new form with an existing template. Go to File>New>New. Select the MicrosoftFax template and click OK.
3) Next, go to File > Save to save your form. Name it MicrosoftFax.fom. 4) You can now close the VDP Designer since we have our form which we will be using alongside the Workflow Designer to route the document. 5) *Now that we have our form, we can begin to fulfill the desired MicrosoftFax workflow using the Workflow Designer. First, the Workflow Designer must be started. 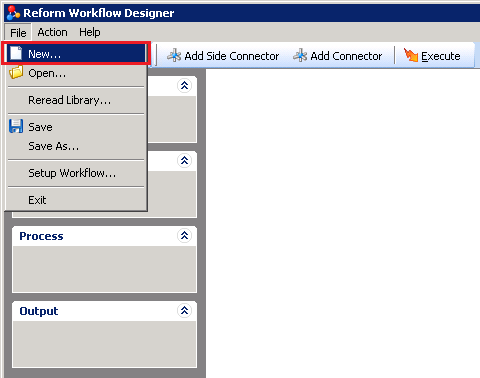 6) To open it, go to Start > Programs > Reform… > Workflow Designer. 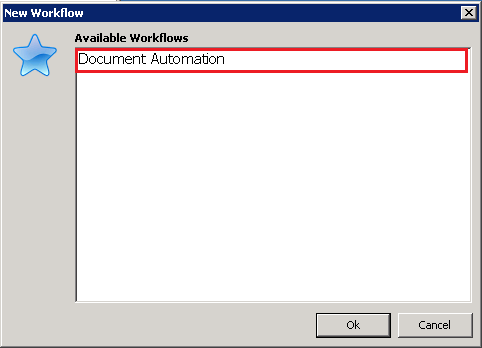 8) Select "Document Automation" and click Ok.
10) We can start adding the necessary components to the workflow. First, drag and drop a Form and File object onto the workflow by clicking and holding your mouse on Form and File and then moving your mouse over to the workflow and releasing the mouse button. 11) Enter a description for the object you just added. This is done by typing in the provided box. Type "Microsoft Fax Demo" and click Finish. This will take you back to your workflow. 12) Now we are ready to configure the "MicrosoftFax Demo" form and input file. To do so, right click on the newly added object and select "Configuration…" or simply double-click on it. 13) You are now presented with the Input Setup window. First, we want to select the text file or data stream that our form will be using. To do so, you can simply begin typing in the box, or you can browse to find it. We want to select the MicrosoftFax.out file. Click the small folder icon to bring up a window which will let us choose that file. Select the file and click Open. 14) After choosing the text file, you are taken back to the Input Setup page so that you can now select a form. 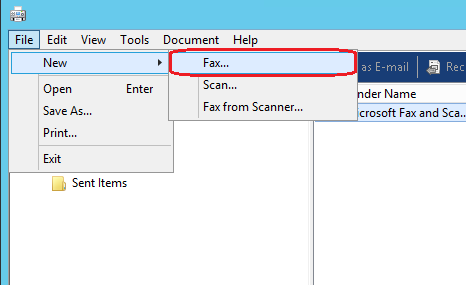 Click the small folder icon to bring up a window which will let us choose the desired MicrosoftFax.FOM form file. Select the FOM file and click Open. 15) Now that you have both your Input text file and Reform Form selected, the setup of Form and File is complete. You can quickly double check that the correct files are selected and then click Finish. 16) You will be prompted to add a page-break field to the form. At this point, we want to select No. 17) To finish the Fax workflow, we want to add a Microsoft Fax Output. We use the same drag and drop procedure as with the Form and File (see step 9). 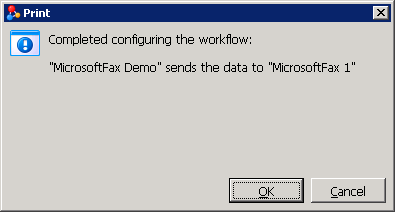 Take your mouse and drag the "MicrosoftFax" object from under Output onto the workflow somewhere below your Input. 18) Once you click Finish, you are taken back to your workflow. Your MicrosoftFax will have a Red Caption because it is not yet configured. 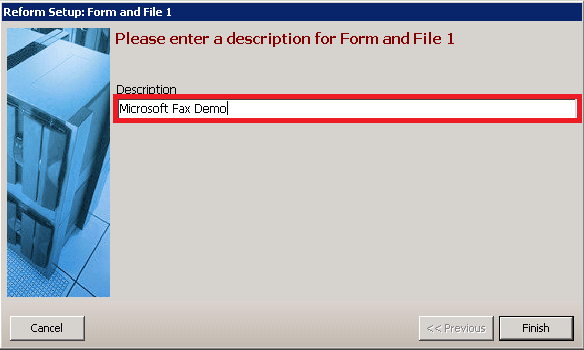 To configure MicrosoftFax, you must first connect the Form and File object titled "MicrosoftFax Demo". To do so, first select the "Add Connector" button from the menu bar. 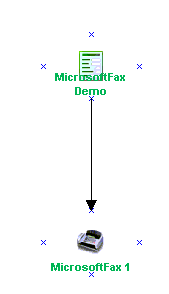 Next, drag your mouse from the small "x" underneath "MicrosoftFax Demo" to the small "x" above "MicrosoftFax" as pictured below. When the connection is complete, the connecter will turn black (if red, connection has not been made correctly, try again) and the "MicrosoftFax Demo" caption will turn green. 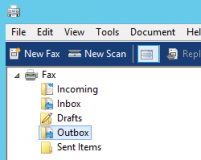 19) You will be prompted to configure MicrosoftFax upon completing the connection. Click Yes. 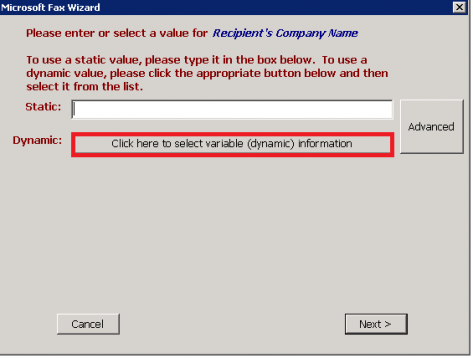 If you choose not to, you can also double click on the Microsoft Fax object or right click and select "Configuration…". 20) The first page will ask for the "Server Name". Please type the name of your fax server and click the Next button. If the fax printer and modem is located on the same server as Reform, then click the Skip button. If the fax printer and modem is being shared from another Fax Server (not installed locally on the Reform server), ensure the steps in the Configuring the Reform Server to communicate with an external Fax Server section of this manual have been completed before continuing. 22) We would like to enter a dynamic value for Recipient’s Company Name. This can be done by clicking the "Click here to select variable information" button. *Note: After doing so, we see that a list will appear with the different fields that you can choose for your variable data. If you want to go back to static input mode, you can do so by clicking the appropriate button for static information and you will then be able type static information. 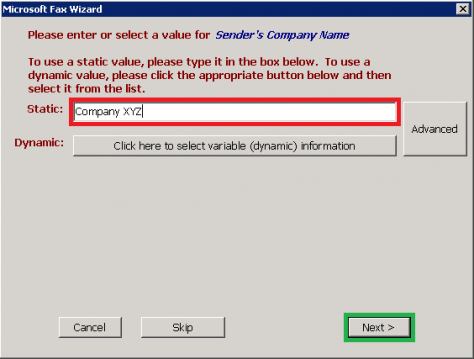 23) We want to use the dynamic field SoldToName as the "Recipient’s Company Name". Select SoldToName from the list and then click Next button. 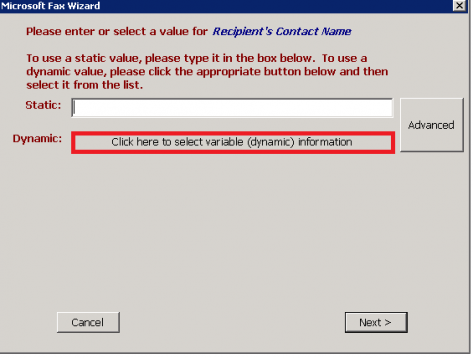 24) We would like to enter a dynamic value for Recipient’s Contact Name. This can be done by clicking the "Click here to select variable information" button. 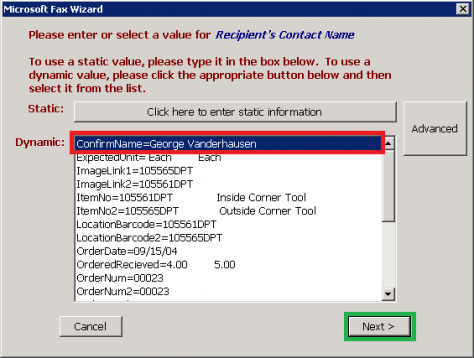 25) We want to use the dynamic field ConfirmName as the "Recipient’s Contact Name". Select ConfirmName from the list and then click the Next button. 26) Next, we want to enter a value for Recipient Fax Number. Here, you should enter a fax number that you can receive test faxes at for this demonstration. Note: in a production scenario, you would need to select variable information from the data stream by clicking the "Click here to select variable information" button. 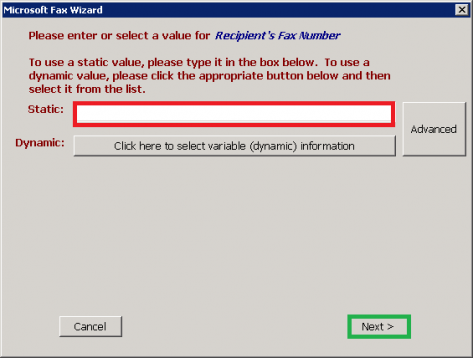 Once the desired fax recipient number is entered or selected, click the Next button. 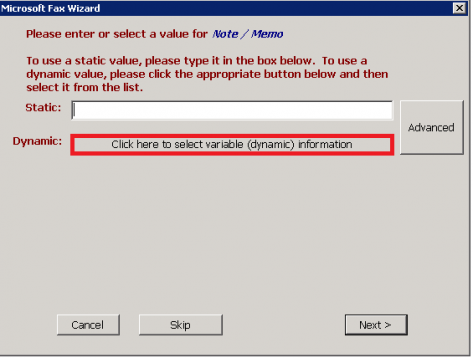 27) Next, we would like to enter a dynamic value for Note / Memo. This can be done by clicking the "Click here to select variable information" button. 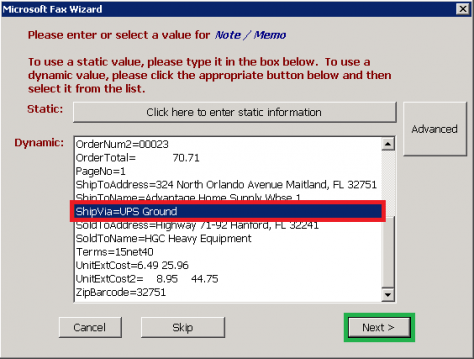 28) Use the dynamic field ShipVia as the "Note / Memo". Select ShipVia from the list and then click the Next button. *Note: The next section demonstrates how to configure the sender’s information that populates the selected cover page. For this demonstration, the majority of these values will be manually entered. If the text file captured the sender’s details, it could be used by clicking the "Click here to select variable information" button and selecting the appropriate field. 9. Next, we want to enter your company name for Sender’s Company Name, and then click the Next button. 10. Next, we would like to enter a dynamic value for Sender’s Billing Code. This can be done by clicking the "Click here to select variable information" button. 11. 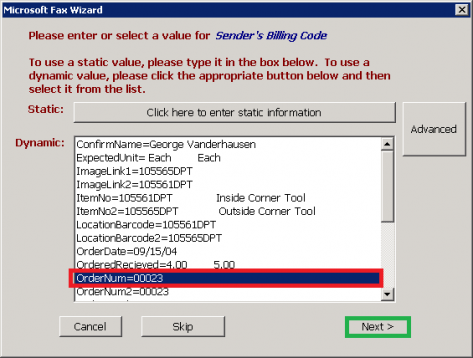 Use the dynamic field OrderNum as the "Sender’s Billing Code". 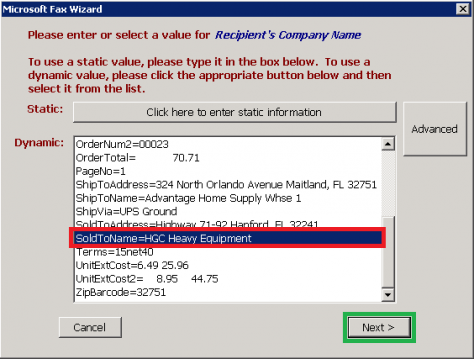 Select OrderNum from the list and then click the Next button. 12. Next, enter your name for Sender’s Name, and then click the Next button. 13. Next, enter your title for Sender’s Title, and then click the Next button. 14. 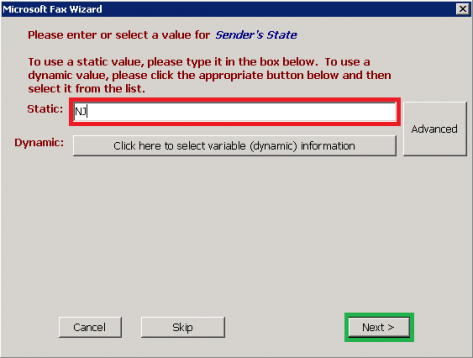 Next we want to enter a value for Sender’s Department, and then click the Next button. 15. Next, enter your location for Sender’s Office Location and then click the Next button. 16. Next, we will skip the Sender’s Email Address, by clicking the Skip button. 17. Next, enter the desired phone number for Sender’s Office Phone Number, and then click the Next button. 18. The Sender’s Alternate Phone field is optional. For this demonstration, we want to skip this field. Click the Skip button. 19. The Sender’s Home Phone Number field is optional. For this demonstration, we want to skip this field. Click the Skip button. 20. 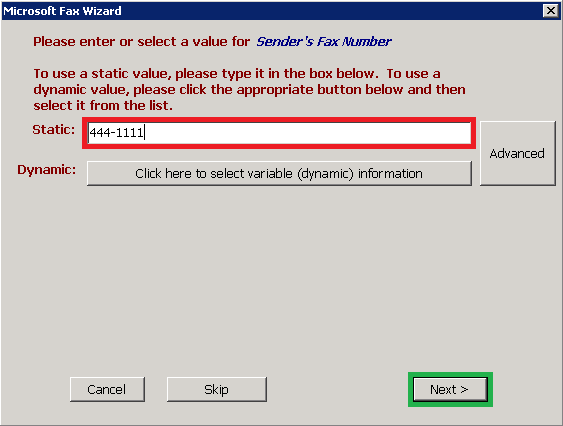 Next, enter your fax number for Sender’s Fax Number, and then click the Next button. 21. Next, enter your office’s address for Sender’s Street Address, and then click the Next button. 22. 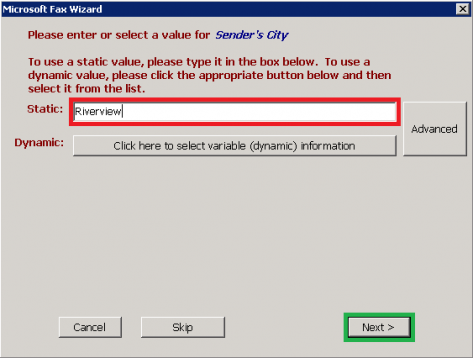 Next, enter your office’s city for Sender’s City, and then click the Next button. 23. Next, enter the initials of your state for Sender’s State, and then click the Next button. 24. Next we would like to enter a dynamic value for Sender’s Zip Code. This can be done by clicking the "Click here to select variable information" button. 25. 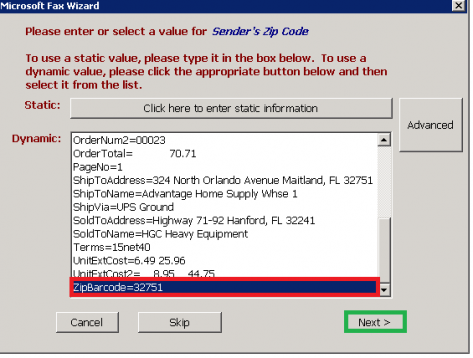 Use the dynamic field ZipBarcode as the "Sender’s Zip Code". Select ZipBarcode from the list and then click the Next button. 26. The Sender’s Country field is optional. For this demonstration, we want to skip this field. Click the Skip button. 27. You have completed configuring your MicrosoftFax workflow. Your 2 objects ("Microsoft Demo" and "MicrosoftFax") should all be green meaning they have been successfully configured and the workflow is ready to be created. 29. You can now close the Workflow Designer. Your form has been saved in your default forms directory. 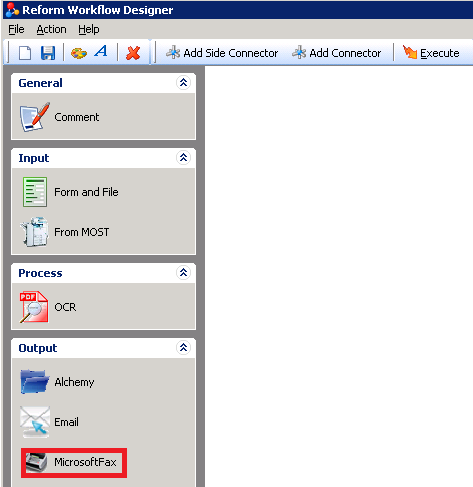 A backup of your original MicrosoftFax.FOM file has been copied to the "Workflow Designer Original Forms" folder in your forms directory. Important: Any permanent form changes should be made to this original form as it is used throughout the form configuration process as a template. If changes are made to this template, you will have to execute your workflow again to see the changes in the forms. 30. The Spooler should now be started by going to Start > Programs > Reform… > Reform Spooler. Once it is open, press the Start button. If the Spooler was already running and started, it will need to be stopped and refreshed so that it recognizes the new forms that were created by the wizard. Click the Refresh button to accomplish this. 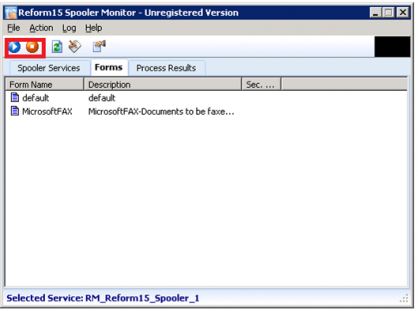 We are now going to simulate a user sending a fax by copying a print stream to the Spooler directory to be processed. Navigate to your \Reform…\Backups\ directory. Select the MicrosoftFax.out file, right click the file, and select Copy. 32. When the Spooler Application begins processing the file, you will notice the file name change to something similar to the image below. 33. Once the print stream has been moved to \Reform…\Backups\ directory, this means that the processing has finished. 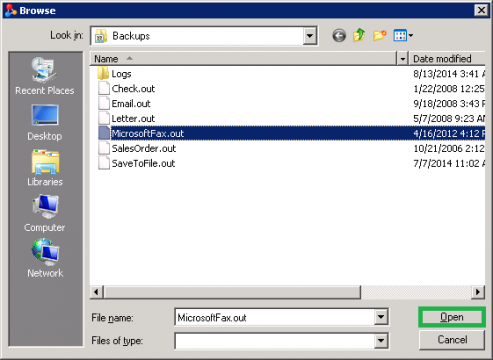 Switch to the Fax Console window and select Outbox from the left column. 34. On the right pane in the Fax Status window, you will see the fax you just sent in the list. 35. The fax has now been queued for sending. Double click on the list item and an image of the fax will open in your default image viewer. 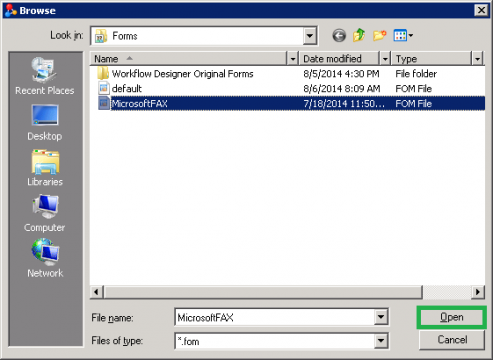 Windows 2012 has a known issue with fax communications in some cases. It is recommended to check the Windows Event Log on the Fax Server for errors. If you see an error matching one of the following errors, your server may be affected by the issue. The Fax Service Provider ’Microsoft Modem Device Provider’ encountered a problem and needed to close. The issue is documented as a problem with the file "C:\Windows\System32\FXST30.dll". The problematic version of this file, included with Windows 2012 R2, is 6.3.9600.16384. 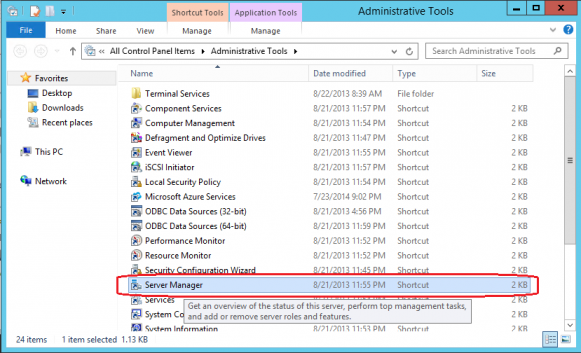 The first, and recommended option, is to attempt an update from Microsoft for Windows Server 2012 R2. To see if this method corrects the issue, visit the Microsoft Knowledgebase article below. The update package will update the problematic file. If the problem continues, even after the update is applied, an older version of the file may be used to replace the problematic one. A copy of the DLL that has worked with various tests is the Windows 7 64 bit version 6.1.7600.16385. 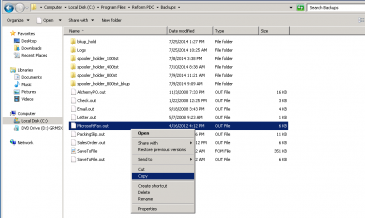 This version of the DLL is included in the Reform…\Plugins\MicrosoftFax\Windows_2012\ directory. The update rollup includes a Fax Server improvement. Although it mentions receiving faxes as the issue, the problematic FXST30.dll on Windows 2012 is also updated. Other company or product names mentioned herein may be trademarks or registered trademarks of their respective companies. This page was last edited on 16 October 2017, at 13:03.